Sunday morning came along quickly and I bounced out of bed and into the shower at 5:30. Wanted to be in transition by 7 for an 8:00 start...The 30 min. drive was uneventful - I love Sunday morning driving to races...the roads are always so empty and you feel like a warrior out there so early. Even though I registered Saturday (thankfully as registration closed by 7) I still needed to get body marked so I took care of that first thing. The weather was overcast and cool but not cold or windy. The forecast called for a 30% chance of rain so I was hopeful it would hold off. It was PERFECT race weather. Everything at this race was pretty well organized. 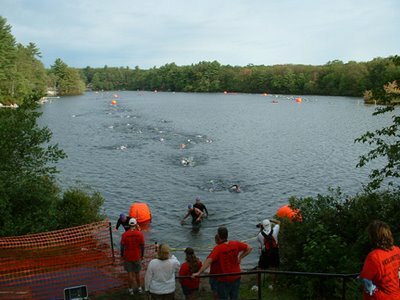 The only issue I saw was that transition was HUGE and also pretty far away from the water...so my T1 and T2 times look like I was lounging by the concession stand for awhile. The upside to this was that we had a lot of space on our racks for everything...and once again, as luck would have it, I ended up at the end of a rack. Score. I set everything up, chatted with my rack-mates and helped a few of them with suggestions to questions they had. And then I walked around to get a feel for the SUPER long run from the water to transition...and to make sure I understood the bike out/bike in and run out/finish configurations. Glad I did this as it was kind of confusing. Once I had it, I went back to my rack and got my swim stuff. Time to warm up. It still had not hit me that I was about to race the longest distance of my tri career. I felt ready physically. Not super strong, rarin' to go ready, but prepared. I really wanted to peak for this race but with all the crap going on, I found myself exhausted and just wanting to get it over with. I think that morning I felt kind of sad about that...I'd worked really hard for this and yet my mental exhaustion was translating into body exhaustion. I tried to fight it, to stay in the zone, to not grow weak and to stay sharp...I tried all week and I think I mostly succeeded...my taper was smart, I ate reasonably well...but I knew I just wasn't "ON" and I also knew that I couldn't beat myself up for that. It is what it is. You're here, just do it. I think that's when I started to feel more nervous. Usually I'm excited nervous, READY nervous...this time, I just felt a little SCARED. But I was going to do it. So I always opt to get away from transition as soon as possible...too many people going thru too many emotions and freak outs. I still don't have a wetsuit and the water was 76˚F so I was ok with that - and I still feel like not having to struggle into it saves me all kinds of stress and anxiety before the start! The air was also pretty warm so it was no problem. Wanting to spend some time in the water, I headed over to the pond and got in. The in and out areas were really small and only a few people were in the water...not sure why. But I always take about 10 minutes of easy swimming mixed with a few sprints to get my HR up...so that's what I went to do. As I got about 50 yards out, they started calling everyone back. It was still like 20 mins to the first wave. I was annoyed! I swam a little further as there were still people out further than I was...and then turned with them as they came back toward me. I have no idea why they wanted us out...but I took the opportunity to sprint and elevate my HR so as not to shock it at the start. Then we proceeded to stand around for the 20 minutes until the start. I was in wave 4 (?I think?or was it 3? )..red caps...there were 5 minutes between each wave so people took advantage of that and jumped in for a quick 2-3 min. warmup in each wave - I did the same. At the time, I did wish I could've done a bit more but didn't let it get to me. And then we were OFF! Pool renovations had kept me out of the water so I had not done any swimming in more than a week prior to this race. Surprisingly, I felt good right from the start. Usually ANY time away from the pool leaves me feeling like I'm swimming in molasses. I started, as I now have become accustomed to, on the edge of the pack on the inside line next to the buoys (counterclockwise course so I was on the left)...and toward the front. As usual, everyone started off REALLY fast...but I picked a moderate speed and held it to the first buoy, making sure to not go anaerobic but also pushing a bit to get things going. A few of the fishies took off but more of them evened out or fizzled and by the third or fourth buoy, I started to catch them. The course was nice - warm water, deep and clear, no shrubbery, and the pond was really small....the buoys were really close together (maybe 40 yards?) so sighting was a snap...and it just made the 0.9 mi. go by quickly. I got into a good groove early and felt pretty strong. I think I swam pretty straight and even caught a few of the folks in the wave ahead of me. That's always exciting! 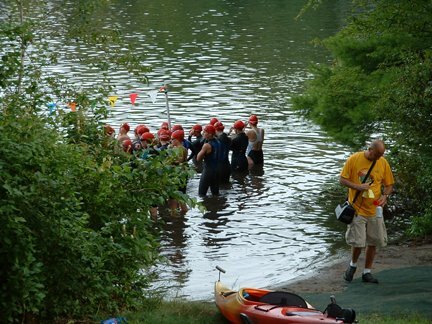 As I approached the swim finish, I could see the bottom but misjudged how deep it was and tried to put a foot down. Whoops! it was deep right up until the last 3 or 4 yards so it was deceptive. Alas, I got out and made my way up the steep hill and thru the maze of fencing...and jogged almost 200 yards (but what felt like MILES) to my bike in T1. Even though the swim is my strongest and favorite of the three disciplines in triathlon, I always breathe a sigh of relief when it's over! I feel like it's the leg I have the least control over...and I stand the most to lose (i.e. drowning!) if things go wrong! OK, forgive me my absence and, as WB pointed out, my introspective moment. For some reason, August seems to be the month of fans and dog doo. Two years running now, August has brought major upheaval. Curious. RACE REPORT!!! Yes, I'm sure you were hoping I'd get there eventually. SO there was a lot of really great training leading up to my first full Olympic distance race, The Cranberry Country Triathlon. It was 7 weeks of SMART training, focused training. Weasel Boy planned it all out for me and I felt very ready physically. I'd done the work. In retrospect, the only thing I could've done more of is brick workouts...it's always such a rude awakening to me when I put all three sports together into one day of racing. I guess that's part of the game. Physically, I was set. Mentally, I was a wreck. My dad's cancer is causing some complications that required him to have surgery the week before the race (which was on August 27th) so my brain was all kinds of whacked out about that. He did REALLY well with the surgery and has recovered nicely. Then my aunt called to say that my grandmother, age 89, in the very advanced stages of alzheimers, was likely not going to make it thru the week. She had stopped eating or taking fluids and it looked like the end was near. Thankfully, she's been comfortable and in good care so her transition from this world would be peaceful...I said goodbye to her the day before my race, thinking I wouldn't see her again. And here we are, almost a month later and she's rallied. Amazing woman, that grandma. Only she knows what's in store... she always liked to keep us guessing. And then, amidst those mentally draining events, I moved. Again. Not going into any details but I'm doing okay with the help and support of lots of great family and friends. Triathlon has given me so so much to prepare for this time in my life and it's carrying me thru the speed bumps. My extended triathlon and swimming family has kept me sane. A huge thanks to ALL of you - you know who you are. Well Folks, things have fallen apart in my world. Working to turn the universe back onto it's feet...race report for my first Olympic Tri is brewing...bear with me while I continue to climb out of my proverbial hole.